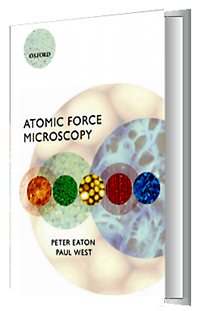 "Atomic Force Microscopy by Peter Eaton and Paul West is the manual that should accompany any AFM." Peter Eaton and Paul West share a common passion for atomic force microscopy. However, their involvement with atomic force microscopes are from very different perspectives. Over the past 10 years Peter used AFM's as the focal point of his research in a variety of scientific projects from materials science to biology. Paul, on the other hand, is an instrument builder and has spent the past 25 years creating microscopes for scientist and engineers. Together Peter and Paul have created an insightful book on the theory, practice and applications of atomic force microscopes. This book serves as an introduction to scientists and engineers that want to learn about these fascinating devices, and as a reference book for expert AFM users. The Oxford University Press page describing the book can be found here, although the contents listed there are out of date. A correct contents overview can be found here: Book Contents. The book was published on the 25th March 2010. It can be found at Amazon.com, Amazon.co.uk , Barnes and Noble, and all major book stores. Click the image on the right to go straight to the amazon page for the book. There is also a Kindle Version of the book available. If you are affiliated to subscribing institution, then you may be able to access it via Oxford Scholarship Online. "Atomic Force Microscopy provides the basic knowledge necessary for successful AFM operation while avoiding the trap of providing more detail than beginners can handle. It boasts seven chapters, each of them accessible and self-contained; readers can thus cherry-pick the topics of relevance for their specific problems. After a short introduction about the historical background and the contemporary context, the book covers practical issues such as understanding AFM design; working in operational modes; measuring, processing, and analyzing AFM images; and spotting and avoiding artifacts. For readers inclined to explore further uses, the book's last chapter discusses various applications that illustrate the multitude of measurement options available with AFMs...Atomic Force Microscopy is a great introduction to AFMs for beginners and, although light on theory, also serves as a good starting point for more serious users." "I recommend this book to any reader who wants to enter the world of force microscopy. This book is easy to read, entertaining, with a practical approach that allows, after their reading, have a realistic idea and practice of this technique. This book touches on all the points and issues that are critical to understanding the proximity microscopy. These include instrumentation, measurement modes, familiarization with the images, the routine procedures for image processing, one section devoted to artefacts and finally potential applications of the technique. From my point of view, is one of the books on microscopy of proximity, which is easier to read and with a high applicability in measuring routines." "The new laboratory is up and running, the Atomic Force Microscope (AFM) is ready - the person who is to operate it sees such a device for the first time. The book by Peter Eaton and Paul West is a great help in this situation. It documents all the properties, advantages, problems and pitfalls of atomic force microscopy, as well as many of its applications. The first two-thirds of the work is a manual, the last third shows examples of possible applications. After an overview of the fundamentals of the AFM instrumentation, the two authors treat and explain the common imaging modes in atomic force microscopy in words, diagrams and example measurements. For each measurement mode you will find instructions on how to prepare the microscope and how to perform the data acquisition. As with any real instrument, there are a whole range of potential errors when measuring with an AFM. The causes can be intrinsically in the device, but also due to incorrect parameter selection. Eaton and West use sample measurements to show how nonlinearities, contaminated probes, and wrong control parameters affect. The pictures and texts are helpful for recognizing many (recoverable) problems. As a rule, the measured data are to be processed and displayed using various rendering methods. The present book not only shows how to perform AFM data processing, but also provides cautionary examples of the unreasonable use of overly powerful image processing algorithms. Structures can be created that are not available in the measurement data. Eaton and West show sample applications in materials science, physics, life sciences and industry. Based on well-selected experiments, the authors show the strengths of the AFM in the respective disciplines and emphasize that not only stationary processes but also dynamic processes can be measured very well. In summary, Atomic Force Microscopy by Peter Eaton and Paul West is the manual that should accompany any AFM." Prof. Othmar Marti, University of Ulm (original review in German here). English version from Google Translate. "A super-clear, easy-to-read, informative, and intuitive introduction to AFM, the best I have found. Normally, I find that books like this can be a bit dense and/or skip over details of how things work, but this book builds everything up intuitively and with such clarity it'd probably be able to be understood by a freshman college student--but, without sacrificing the necessary detail." "A good possibility for beginners in AFM to understand the basics and to gain a deeper insight in this measurement method." "The book is really a practical guide for both inexperienced or advanced AFM user."